In a bouquet of good news, the Flowers TV series has been renewed for a second season on Seeso and Channel 4 (UK). From Will Sharpe, the dark dysfunctional family dramedy stars Olivia Colman and Julian Barratt as Deborah and Maurice Flowers. Daniel Rigsby and Sophia di Martino also star as their children, Donald and Amy. Flowers, season two, will be executive produced by Naomi de Pear within her new Hootenanny label, being launched at Sister Pictures. Diederick Santer is executive producing for Kudos. The second season will film in 2017. Endemol Shine International is distributing. Get the details from this Seeso press release. 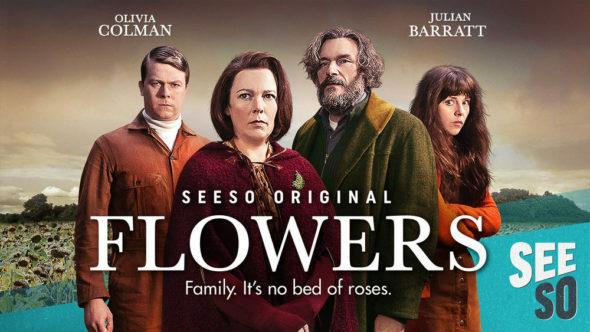 NEW YORK, September 19, 2016 – Seeso today announced that Will Sharpe’s critically-acclaimed series “FLOWERS” will return for its second season with Olivia COLMAN and Julian Barratt, and in association with Channel 4 in the U.K.
“FLOWERS” introduced Seeso viewers to the eccentric Flowers family – Maurice, Deborah and the twins – and was praised for its startling originality and seamless shifts from the profane to the profound in an ostensibly traditional family sitcom setting. Deborah (Olivia Colman – “Broadchurch,” “THE NIGHT MANAGER”) and Maurice (Julian Barratt – “THE MIGHTY BOOSH”) are looking at a new era of their marriage and whether they can survive the challenges laid bare in series one; Maurice’s suicide attempt, Deborah’s infidelity, their grown-up twins’ inheritance of their parents’ emotional foibles. For series two the Flowers’ twins Donald (Daniel Rigby – “BLACK MIRROR,” “ERIC AND ERNIE”) and Amy (Sophia di Martino – “THE DARKEST UNIVERSE,” “FRIDAY NIGHT DINNER”) – whose arrested development was a major part of series one – are now forging their own futures amongst the fallout of their parent’s complicated love and their own new enterprises. Meanwhile, Shun’s unofficial role as Flowers factotum grows ever more convoluted. Can they survive the next chapter of romantically and mentally epic challenges in the spiral that promises to plague the generations of the Flowers family? “FLOWERS” was commissioned by Nerys Evans, Deputy Head of Comedy and Phil Clarke, Acting Head of Drama & Head of Comedy for Channel 4 in association with NBCUniversal’s Digital Enterprises’ comedy streaming platform Seeso (Evan Shapiro, Kelsey Balance and Dan Kerstetter). Season two will be executive produced by Naomi de Pear within her new label being launched at Sister Pictures and Diederick Santer for Kudos (“UTOPIA,” “BROADCHURCH,” “THE HOUR,” “LIFE ON MARS,” “SPOOKS”) and will film in 2017. The series will be distributed by Endemol Shine International. Seeso is the new, ad-free streaming comedy channel from NBCUniversal’s Digital Enterprises. The channel gives comedy viewers access to over 2,000 hours of original programming, with new, original content rolling out daily. Viewers are able to access the curated library for $3.99 a month via www.seeso.com, iOS, Android, Chromecast, Roku, Xbox, Amazon Fire TV and Fire Stick as well as Amazon Instant Video. What do you think? Have you watched the first season of the Flowers TV show? Do you plan to watch the second on Channel 4 or Seeso? Let us know, below. More about: Channel 4 TV shows: canceled or renewed?, Flowers, Flowers: canceled or renewed?, Seeso TV shows: canceled or renewed?